Growing Gladiolus (See Combination Photo Below): Everyone knows gladiolus, but not every gardener knows how easy they are to grow. The original "glad" was a wildflower from South Africa called "sword lily", which was imported into Europe in the 1840's. As with almost every other bulb, the Dutch went to work and created a grand rainbow from a quite lowly flower. Photo A shows many of the beautiful bi-colors we have today thanks to Holland's wildly successful hybridizers. Photo B not only shows an example of the glowing colors now available, but also the beautiful form of the individual florets, often compared to an iris or orchid. Photo C shows stately white "glads" in the garden. This picture is a great illustration of how to plant the bulbs. Put them close together so you'll end up with a mass of color, not just a stick here and there. One of the things that makes growing gladiolus so easy is that the plants take almost no space. You can easily pop in the bulbs between other more permanent plants. Just find the spaces in your garden, put in the bulbs in tight groups wherever you can, and you'll know that in a few weeks, those spots will be glowing towers of color. And of course, everyone knows gladiolus are great in a vase. So be sure to plant plenty where you can cut them. They're inexpensive, and few other flowers give you so much color for the cost. When frost threatens, you can just forget them, and buy new ones in spring, or dig up the bulbs and store them until the following spring. Don't hesitate. Enjoy gladiolus this summer. You can't have too many. Skin irritant. All parts of plant are poisonous if ingested. Toxic to dog and cats. Each season, we head over to the big box store in our area and choose several Bulbs, Plants and Seeds to compare against our selection. This spring, we purchased 50 Gladiolus Bulbs to compare and the difference is quite revealing. I’d like to start out by mentioning the difference in shopping experiences. I walked into the big box store and headed straight to the back, where I knew the garden section was. I walked through aisles of grills, patio sets and annual hanging baskets until I found someone to speak with. They quickly answered the phone and I waited several more minutes until I could ask, "Do you know where the Gladiolus Bulbs are?" They weren’t sure what I meant and finally an entire wall of Summer-Blooming Bulbs caught my eye. I chose their "Gladiolus Mix" bag of 50, which most resembled our Gladiolus Rainbow Mix, which we also carry in a bag of 50 bulbs. When you shop on our site, we have a wealth of information on growing and caring for Gladiolus at your fingertips, as well as an extremely helpful and knowledgeable garden staff, several of which are certified Master Gardeners. We not only want you to have success in growing our products, but also want you to feel confident in everything you plant – Which is why we focus so intently on how-to information as well as have a 100% satisfaction guarantee. We urge our customers to write reviews on our products, positive or negative, so you know what grows well in different areas and what doesn't. We also offer live chat and service over the phone 6 days a week, offering growing advice as well as helping to place orders. This photo also helps to show the true difference between us and the Big Box Stores. Brian, one of our employees and garden-enthusiasts helps to explain why a bigger flower bulb is better. 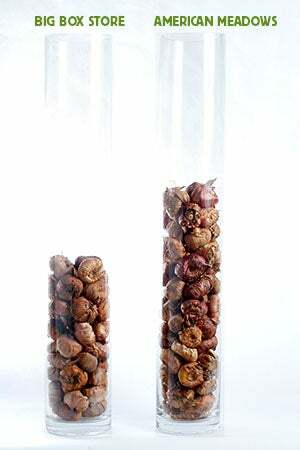 "Several flower bulbs are part of the onion family, and because of this I like to use Onions as a representation of how important bulb size is. Which of the onions on your shelf go bad first? The smallest ones! Larger onions are more resilient, taking longer to dry out/rot and can withstand swings in temperature better. Flower bulbs are the same. Larger bulbs will withstand disease, draught, large amounts of moisture, and colder temperatures significantly better than the smaller ones. They also produce taller growth and larger blooms." With American Meadows, you’re not only getting access to our thirty years of gardening experience, but are also receiving the largest, highest-quality bulbs available, inevitably producing larger, healthier blooms in your garden. Happy Gardening!